Oselli have been rebuilding and restoring Classic and Sports cars for many years. With our engineering and vehicle workshops fully equiped to support, remanufacture and performance enhance then to complement and meet customer demand we have restored many vehicles over the years. 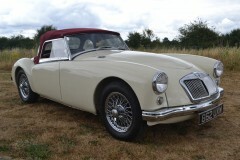 The MGA is probably the icon of the british sports car! 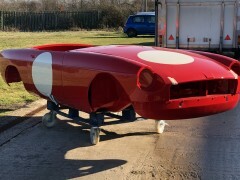 Currently we are restoring two MGA Roadsters to 'as new' condition. The restoration includes body off rebuild with shot blasting and powder coating of chassis and full rebuild of body and all panels. At the same time, like many of our rebuilds it makes sense to sensitively improve where possible for todays requirements. Not just by way of anti corrosion materials but also to enhance the drive. Both MGA's currently in progress are being rebuit to the highest spec, including a 1950cc five bearing 'B' series engine with stage 2 lead free cylinder head, five speed gearbox, negative earth alternator charging and single 12 volt battery. Electronic ignition, disc brakes with servo assistance, all of which is sympathetically installed to make the car look as standard as possible. In addition to the mechanical and structural upgrades the cars are finished in choice of colour with leather seats and mohair hoods and toneau covers.Chrome wire wheels and all other chrome parts replaced. Prices of all rebuilds are very much subject to final spec of course but as a guide the MGA prices for an as new car with 12 months 'no quibble' warranty start from £39,000 +vat for the ultimate specification. These cars are better than new and a great investment! Over the years we have rebuilt many MGB Roadsters and GT's usually to our graduate spec using the heritage body shell when available. 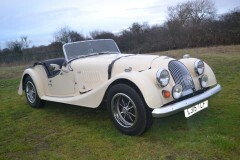 Prices for the MG rebuild start at £20,000 through to £36,000 depending upon spec. At Oselli we have over 30 years experience with the Aston Martin marque. From DB2,4,5,6,V8 range through to DB7 we can service, repair and restore this very specialised vehicle. With some conciderable years working directly for the Aston Martin factory our technical expertise is unique and far beyond any other specialist in this field. We know virtually every nut and bolt on these cars and with the Oselli engineering facility we carry out all operations from engine rebiuild, lead free conversions, overahauls to full restoration. For more pictures of Aston Martin restorations and engine rebuilding and reclaimation of cylinder blocks click the link below.